Performance reviews are a forum for praise and improvement between supervisor and employee. In today’s professional society there has been an organizational shift to ongoing performance management. 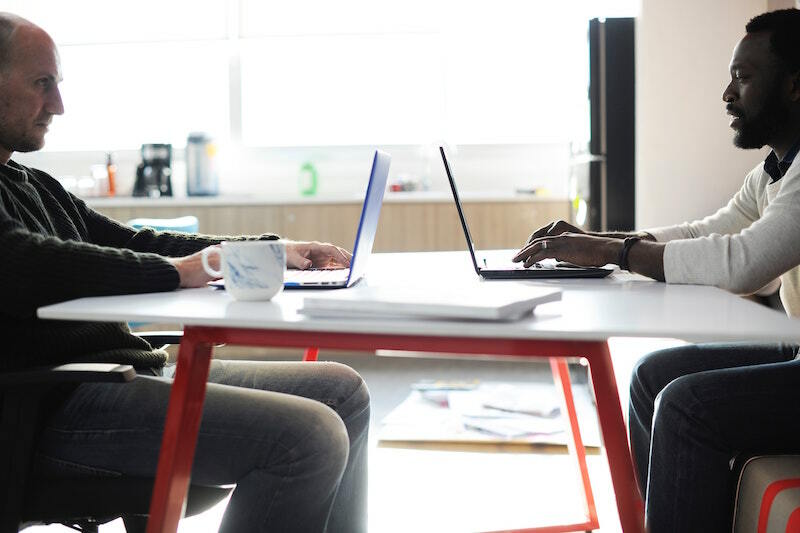 Performance reviews aid a number of areas, including: performance; encourage communication; improved connection and team cohesion; employee development and creating a safe, positive work environment. 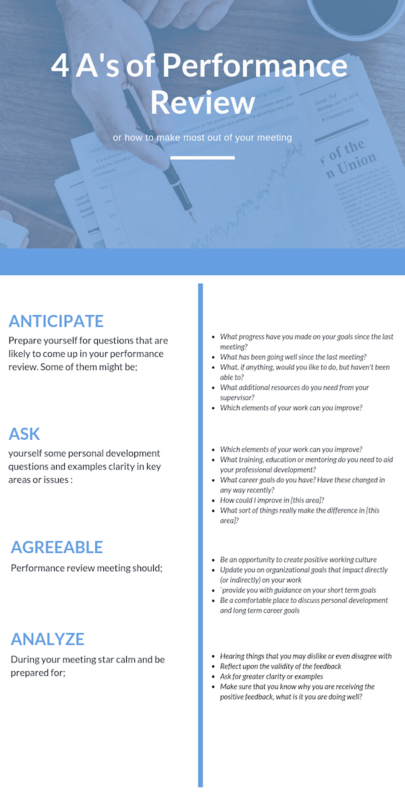 As an employee, it is imperative to get the most out of performance review meetings; below is a simple checklist to make sure you’re doing all you can! Review the objectives and goals set for the current period, and evaluate your performance in relation to them. Complete a self-assessment. Evaluate and identify key indicators of your performance. How have you performed in relation to your objectives? What have you done well? What hasn’t gone so well? Where can you improve? What do you need from your manager to perform even better? This gives you an overview of what can be discussed during your review. Devise notes to make sure that you are not solely relying on your memory. If there is something that you notice between reviews, make a note of it; regardless of the nature of the incident, good or bad. If needed, discuss the issue with your manager immediately. If not, make a note of it so you can bring it up at the performance review. A helpful method for achieving the best performance review possible, is receiving continuous feedback. You should also prepare questions to ask in order to get most out of your performance feedback. You as the employee should never hear about your performance once a year at your review. If you’re not receiving continuous performance feedback from your manager, make it a priority of yours to get continuous performance feedback to aid your development. During the meeting, remember the 4 A’s: Anticipate, Ask, Agreeable, Approach. What progress have you made on your goals since the last meeting? What has been going well since the last meeting? What, if anything, would you like to do, but haven't been able to? What additional resources do you need from your supervisor? Which elements of your work can you improve? What training, education or mentoring do you need to aid your professional development? What career goals do you have? Have these changed in any way recently? How could I improve in [this area]? How have people improved in [this area] in the past? What sort of things really make the difference in [this area]? I’m struggling to understand what more I can do to improve [in this area], can you help? Agreeable. When in your review, remember to be honest, realistic, objective and specific. The meeting is an opportunity to develop a positive working environment. You should be updated on organizational goals that impact directly (or indirectly) on your work. It should also provide you with guidance on your short term goals and also be a comfortable place to discuss personal development and long term career goals. Before concluding the meeting, both parties should review any items that may carry over to the next meeting, which can include: employee goals, challenges, deadlines and key tactics for achievement. Analyze. As mentioned earlier performance reviews are a forum for improvement and development. This means hearing things that you may dislike or even disagree with. During the meeting, think and compose your thoughts before reacting in a confrontational manner. Use this time to reflect upon the validity of the feedback, perhaps ask for greater clarity or examples. This mantra works for positive feedback as well. Make sure that you know why you are receiving the positive feedback, what is it you are doing well? Ask for clarity here as well, so that you continue to do things successfully. Your performance review should be a learning opportunity. You should be able to take valuable information away from your review; both positive (about what you’ve been doing well) and constructive (about what you can be doing better). This guides you towards personal and professional career development. If you feel that you received an unfair or unjust review, consider responding to it. Before responding, give yourself enough time to reflect on what was said, so that you can ‘review the review’ objectively. Perhaps what was said was fair but was provided without clarity. In that case ask your manager for a meeting to discuss the points raised further, allowing you to receive a deeper understanding on what can be improved and how. If, however, you conclude that the review was unjust, set up a meeting with your reviewer. Acknowledge areas of agreement, and corroborate those that you feel were unfair with examples and/or evidence. You shouldn’t enter this meeting with a vendetta, as this will in turn have a negative effect post-meeting. Try and come to conclusions objectively and as a team. Ultimately, by the end of the performance review you should be able to answer the question: Where do I go from here? If you enjoyed reading this blog or just wanted to learn more about different areas in the HR sphere, feel free to read our others. If you’re interested in what PeopleGoal is and how we can help you, read our reviews and FAQ’s; you can even try our platform in a free 14-day trial!